Wednesday morning's commute looks like a mess. Another messy storm is on the way. We'll have sunshine Monday, then the storm moves in late Tuesday. 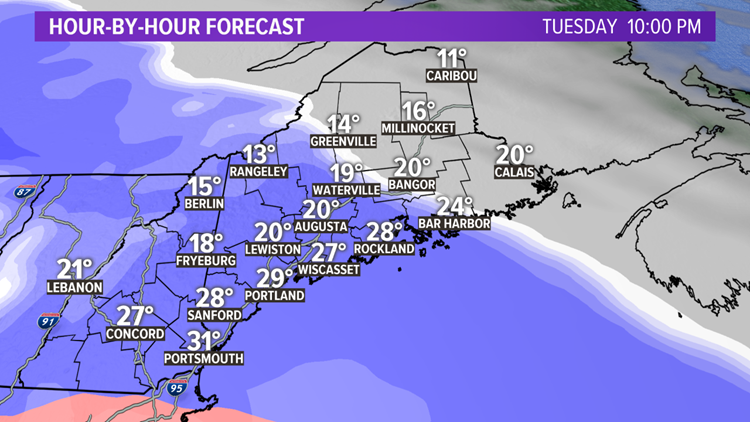 Snow will start in western Maine around sunset Tuesday. The exact timing will be important for the Tuesday evening commute in the Portland area. If it speeds up at all, more of the commute would be affected. 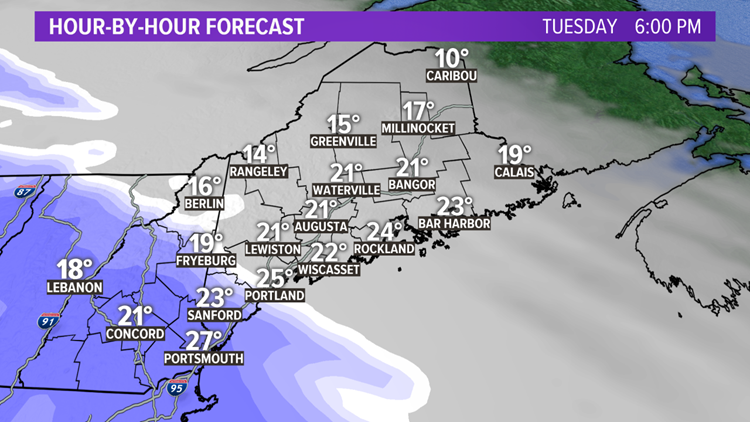 In eastern and northern Maine, the evening commute will be dry. 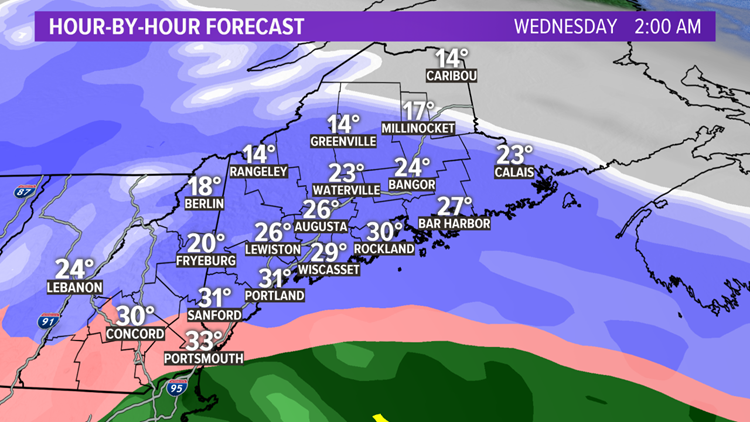 Right now, I'd estimate the snow starts in Portland around 6 p.m., Augusta around 8 p.m., Bangor around 10 p.m., closer to midnight in far northern and eastern Maine. Like we've seen in so many storms this winter, a wedge of warm air will move in aloft. This will melt the snowflakes, refreezing into sleet pellets before making it to the ground. By 2 a.m., mixing is likely to start in parts of York County. Before this happens, most areas should see at least 6 inches of snow and some will see more. During the early morning hours, snow will continue but sleet may start to mix in farther north, perhaps even up to Lewiston, Augusta and Bangor. The model shown below is one of the colder ones, others are a bit warmer. This is something we'll keep an eye on Monday and will tweak the forecast as needed. 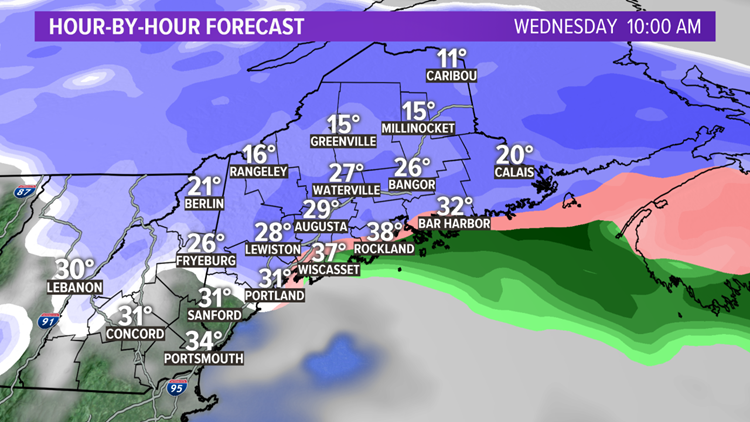 Near the coast, expect a messy mix of sleet, freezing rain and rain Wednesday morning. 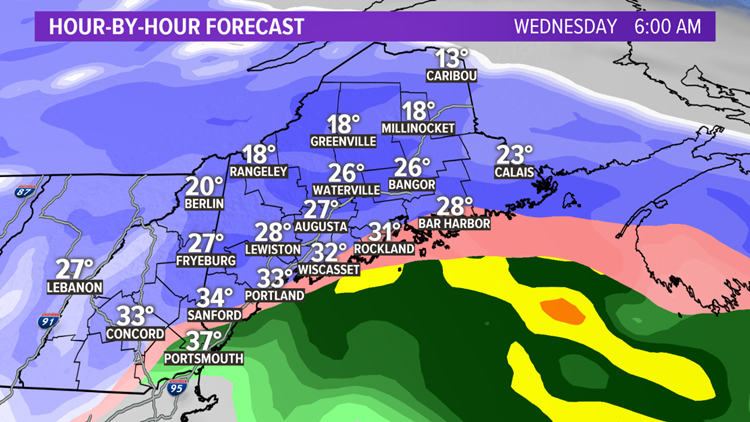 Everything will taper off late morning and midday in western Maine, it'll keep snowing in eastern and northern Maine into Wednesday afternoon. 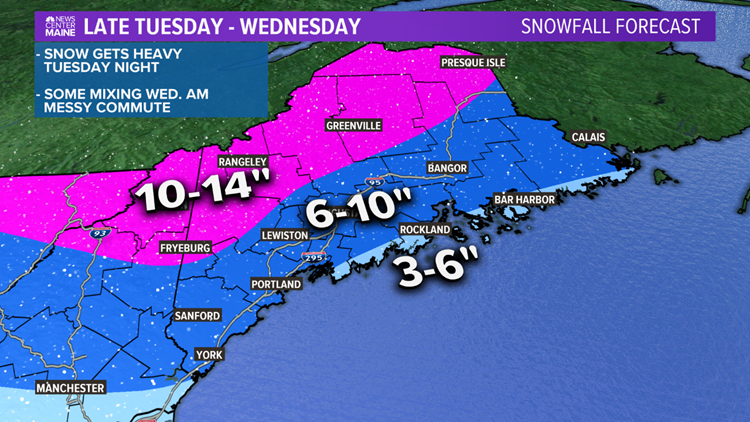 The Wednesday afternoon/evening commute should be much better, except in northern Maine. Right now, we're expecting 6 to 10 inches of snow in most of the state, with some mixing possible after that. A bit less than 6 inches may fall on parts of the Midcoast and Downeast, where there's a higher chance of rain mixing in Wednesday morning. Farther north and west, mostly snow is expected, 10 to 14 inches. Stay with us on-air and online for updates.